A vintage 1819 locomotive adjacent to the Colorado Welcome Center in Lamar is a local attraction. 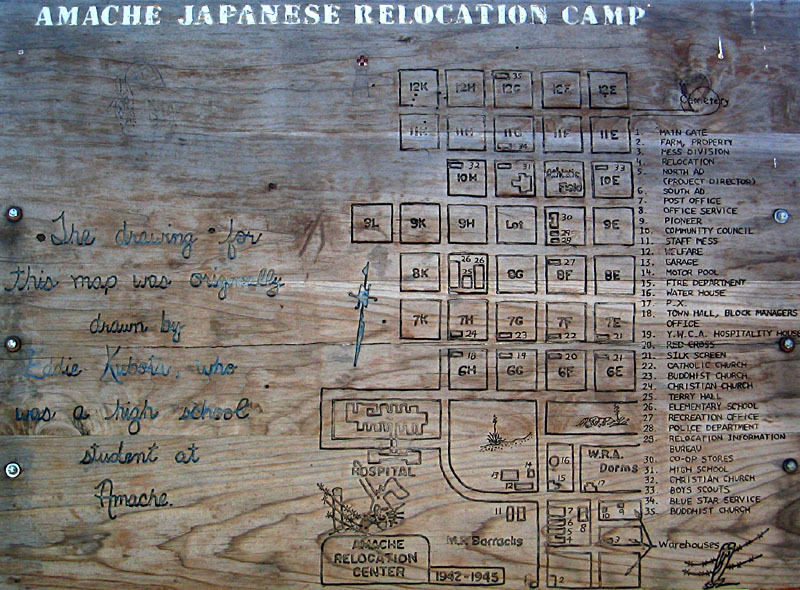 A map of Camp Amache, site of a WWII era Japanese Internment Camp. The Granada Relocation Center was one of ten relocation camps authorized by President Roosevelt in 1942. Prowers County citizens participate in the preservation and interpretation of this National Historic Landmark. During the last four centuries, the land that now makes up Prowers County (population 13,974) has been claimed twice each by France and Spain; once each by Mexico and Texas, was part of a United States Territory, and has been part of the State of Colorado since 1876. The Kiowa, Cheyenne, Comanche, and Arapahoe Plains Indian tribes migrated through the area and many wintered along the Arkansas River. Prowers County was formed in 1889 and named after the first rancher in the area, John Wesley Prowers. His wife was a Cheyenne princess, Amache Ochinee, after whom a local World War II era Japanese internment camp was later named. The community of Lamar, now the county seat, has a colorful history that began with a hijacking in May of 1886. With the westward movement in full swing, township development was extremely profitable along the Santa Fe Railroad line. The most likely site left in southeastern Colorado for platting was located at Blackwell Station, railroad milepost 499. However, the adjacent landowner, A. R. Black, was opposed to establishing a town site. “Platters” threatened to move the depot and obtain title to land nearby. Tensions heated and Mr. Black sought a court ordered injunction. Mere hours before it was issued, Mr. Black was lured to Pueblo for “important business” by a false telegram. That very evening a trainload of men, each paid $10 and promised all the beer they could drink, arrived at the station. Armed with shovels, picks, jacks and blocks, they loaded the Blackwell depot onto flat cars and moved it three miles west, throwing aside the Blackwell sign and mounting the name Lamar, after the Secretary of the Interior under Grover Cleveland. Prowers County is home to the Big Timbers Museum, with a collection of artifacts from early settlement days and the Dust Bowl era. It features a collection of extremely rare World War II posters. There are also items relating to the Fleagle Gang bank robbery in 1928, a case notable for resulting in the first conviction solely based on a fingerprint of one of the accused. The County has recently focused its citizen volunteer efforts on Camp Amache, the Granada Relocation Center that was one of ten relocation camps authorized by President Roosevelt in 1942. Citizens participate in the preservation of this National Historic Landmark in several ways. 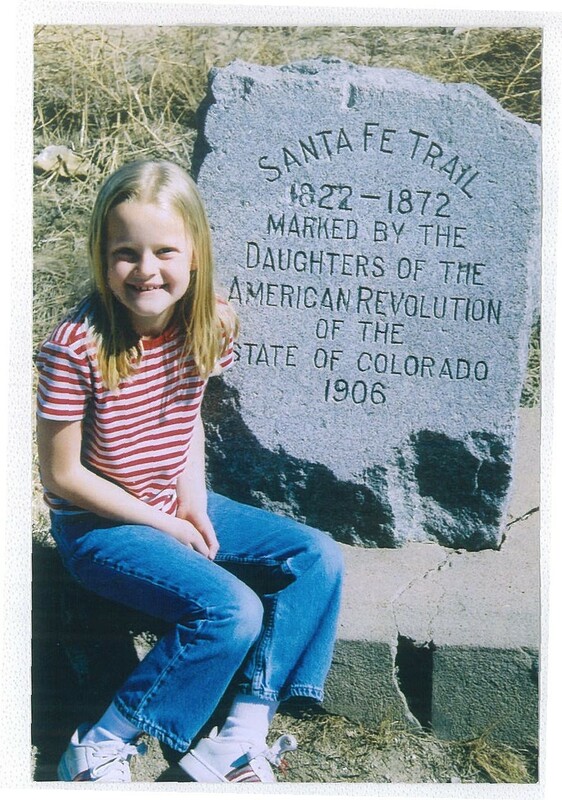 The Amache Preservation Society, comprised of students at Granada High School who are enrolled in a special class that focuses on the preservation and interpretation of the site, maintain the cemetery grounds, provide guided tours, give presentations to other groups, work on restoration and volunteer in the museum. The local 4-H Club maintains the camp corral. The Town of Granada also organizes volunteers to assist with site maintenance several weekends a year and to staff the museum during the summer months. The museum displays artifacts used by residents, videotaped testimony of the detainees and their descendents, and a scale model of the camp. The camp is open to the public and visitation has increased between five and ten percent annually, with the largest boost coming in 2006 with the National Historic Landmark designation. A yearly ceremony in May, open to the public, welcomes back individuals who were residents of the camp who come to reflect on their experiences there. Last year nine internees participated, as well as individuals from other internment camps throughout the country. Prowers County has also surveyed its numerous New Deal era historic resources. Pike’s Tower in Lamar, one of the first significant WPA projects, was rededicated in recent years. A vintage locomotive adjacent to the Colorado Welcome Center in Lamar is another local attraction.